Emphysematous osteomyelitis is a rare but a potentially fatal condition that must be considered whenever intraosseous gas is identified on imaging. The organisms implicated in most cases of emphysematous osteomyelitis are anaerobes or members of Enterobacteriaceae family. The association of Salmonella More Details osteomyelitis with sickle cell anaemia is well established. To the best of the author's knowledge, there has been only one case of recurrent salmonella osteomyelitis in a beta thalassemia trait reported in literature. We present a unique case of emphysematous osteomyelitis caused by Salmonella typhi in a beta thalassemia major. A 29-year-old male, known case of beta thalassemia major, presented with pain in left hip joint associated with limitation of movement since 5 days and fever since 3 days. At 12 years of age, the patient underwent splenectomy due to increased blood transfusion requirements. Vitals were stable except for a body temperature of 102°F. 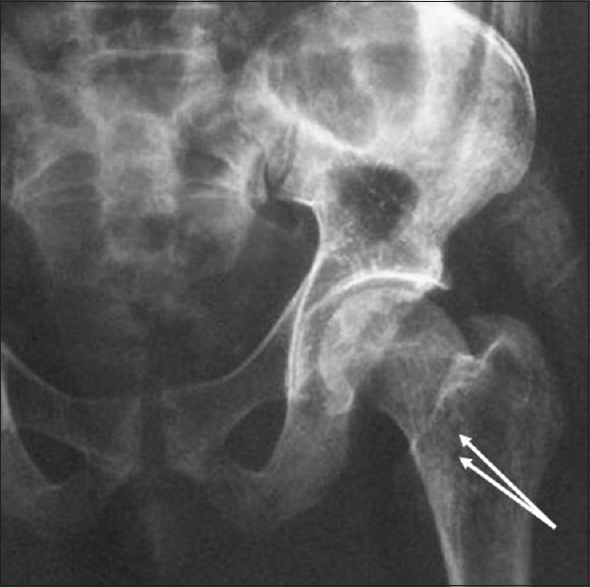 On physical examination, restricted and painful passive and active movements along the left hip joint were noted. A complete blood count (CBC) was done revealing total leucocyte count (TLC) of 28,320/mm3 with 54.3% neutrophils, erythrocyte sedimentation rate (ESR) of 120 mm at the end of 1 h, C-reactive protein (CRP) of 68.9 mg/L, and blood culture grew non-lactose fermenting colonies on MacConkey agar and agglutination with salmonella polyvalent O antisera suggested Salmonella species. Further agglutination with Salmonella Factor 09 antisera was done, which was positive and was confirmed to be Salmonella typhi. Apart from this, manual test for biochemicals of peptone water for Indole, Triple Sugar Iron (TSI), urea hydrolysis, and cirate utilisation also suggested Salmonella species. Antimicrobial susceptibility testing done by VITEK 2 showed pansensitive to most antibiotics except partial resistance to quinolones. Stool and urine culture were also done to determine the carrier status in this patient, but turned out to be negative for Salmonella. Radiograph was suggestive of air in the head and proximal shaft of left femur [Figure 1]. Computed tomography (CT) scan confirmed the presence of air pockets in the head and shaft of left femur and left iliacus muscle. In magnetic resonance imaging (MRI), altered signal intensity areas were seen in the left femur neck and upper two-third of shaft with signal voids within suggestive of air specks. There were hyperintensities on T2-weighted and on short tau inversion recovery (STIR) sequences. A focal breach in the cortex of femoral neck was identified posteriorly near the lesser trochanter. Altered signal intensity was noted in left iliacus, obturators, and gluteus and vastus lateralis suggestive of myositis [Figure 2]. The patient was treated with intravenous amikacin and cefuroxime, and left hip exploration was done under general anaesthesia. Black colored pus was drained and sent for culture and sensitivity which turned out to be Salmonella typhi. After surgical exploration, a drain was placed in the bone window created for drainage of pus and discharge. On discharge, he was started on oral amoxicillin–clavulanic acid for 3 weeks. He was readmitted 20 days later with pain and swelling over left hip and pus discharge from the drain. Complete blood profile showed TLC of 18,430/mm3 with 58.4% neutrophils, ESR 130 mm/h, and CRP of 34.64 mg/L. MRI revealed femoral altered signal intensity, air speckle, and intra marrow collection which had reduced compared to previous MRI. There was also intra marrow fluid collection communicating into intermuscular plane and vastus lateralis forming a thin tract, from intermuscular plane to skin, with mild joint effusion. Re-exploration of left hip was done which revealed pus and necrotic tissue over posterior-lateral head, neck, and proximal diaphysis. Thorough pulsed lavage was done with gentamycin and saline along with betadine and hydrogen peroxide. After discharge, the patient was started on cefixime for 4 weeks and he underwent hyper baric oxygen therapy and physiotherapy. After 4 weeks, the patient continued to remain afebrile. 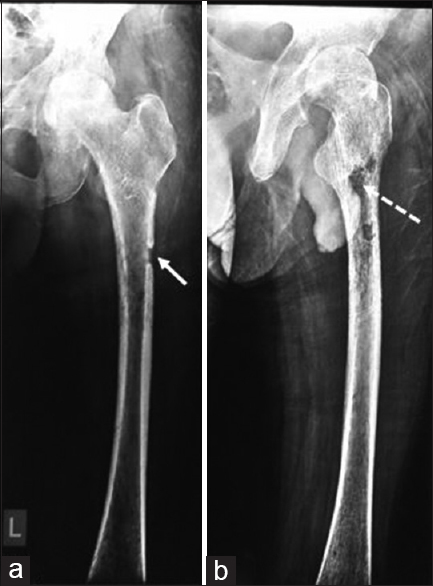 CBC and ESR were within normal limits and X-ray showed a bone window created surgically on the posterio-lateral aspect of proximal left femur and radiolucency due to surgical debridement [Figure 3]. Three months later, he developed left hip joint deformity with restricted movements in the joint. A preceding history of infection is not usual. Stool cultures indicative of carrier state may or may not be positive. Initial investigations include CBC, inflammatory markers (ESR and CRP), and radiographs followed by MRI. These modalities help identify bone infections. In our patient, CT scan showed hypodense focii in the affected bone confirming the presence of air pockets. Also, MRI T-2 weighted and STIR sequences showed hyperintensities in the affected bone. Blood culture was positive for Salmonella typhi in our case, but positive results have been reported in only 71% of patients with salmonella osteomyelitis. When emphysematous osteomyelitis is seen, empiric antibiotics with activity against anaerobes and members of Enterobacteriaceae family should ideally be initiated after obtaining sufficient samples from bone for microbiological assay. Ampicillin, chloramphenicol, third-generation cephalosporins, and quinolones have been used. Our patient was started on IV amikacin and cefuroxime and later switched to oral amoxicillin–clavulanic acid on discharge. Most of the studies stated that the most effective therapy of a confirmed salmonella osteomyelitis is a combination of radical operative intervention and targeted intravenous antibiotics sensitive to the organism. Hyperbaric oxygen therapy has also been used as an adjunct. Emphysematous osteomyelitis caused by Salmonella typhi is a rare infection in beta thalassemia major patients and could be attributed to reduced phagocytic and activity following splenectomy, iron overload, and decreased CD4/CD8 ratio., Aggressive surgical intervention and appropriate antimicrobial are required as emphysematous osteomyelitis is associated with significant morbidity and mortality. Luey C, Tooley D, Briggs S. Emphysematous osteomyelitis: A case report and review of the literature. Int J Infect Dis 2012;16:216-20. Engh CA, Hughes JL, Abrams RC, Bowerman JW. Osteomyelitis in the patient with sickle-cell disease. J Bone Joint Surg Am 1971;53:1-15. Rayan F, Mukundan C, Shukla D. Case of relapsing Salmonella osteomyelitis in a thalassaemia trait patient. J Orthop Trauma 2009;10:31-3. Ram PC, Martinez S, Korobkin M, Breiman, RS, Gallis HR, Harrelson JM. 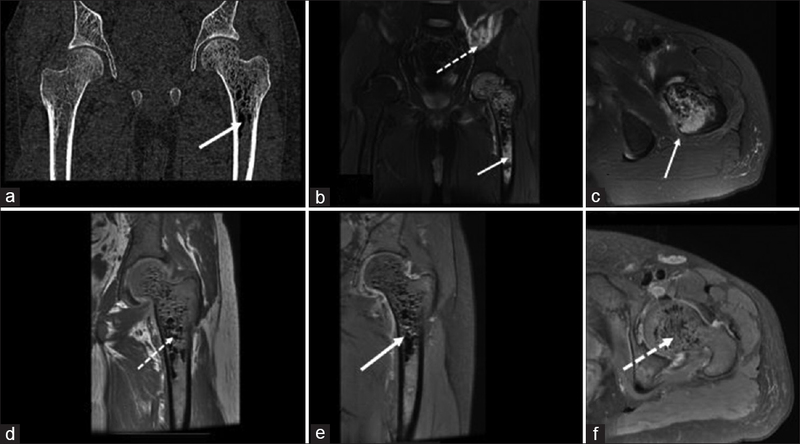 CT detection of intraosseous gas: A new sign of osteomyelitis. AJR Am J Roentgenol 1981;137:721-3. Potocki J, Kaushik S, Mira JL. Anaerobic osteomyelitis of femoral head with intraosseous, intra-articular, bursal and muscle pneumotosis. Skeletal Radiol 2003;32:46-8. Sanchez AA, Mazurek MT, Clapper MF. Salmonella osteomyelitis presenting as fibrous dysplasia. A case report. Clin Orthop 1996;330:185-9. Pallares R, Costa J, Villabona C, Capell S, Garau J. Salmonella typhi osteomyelitis. Med Clin (Barc) 1982;79:339. Cohen 11, Bartlett JA, Corey RG. Extra-intestinal manifestations of salmonella infections. Medicine 1987;66:349-88. Mandell GL, Douglas RG Jr, Bennett JE, editors. Principles and Practice of Infectious Diseases. 1990. p. 1700-16. Farmakis D, Giakoumis A, Polymeropoulo E. Pathogenetic aspects of immune deficiency associated with β thalassemia. Med Sci Monit 2003;9:19-22. Vento S, Cainelli F, Cesario F. Infections in thalassemia. Lancet Infect Dis 2006;6:226-33. Deysine M, Isenberg HD, Steiner G. Chronic haematogenous osteomyelitis; studies on an experimental model. Int Orthop 1983;7:69-78. Banky JP, Ostergaard L, Spelman D. Chronic relapsing Salmonella osteomyelitis in an immunocompetent patient: Case report and literature review. J Infect 2002;44:44-7.